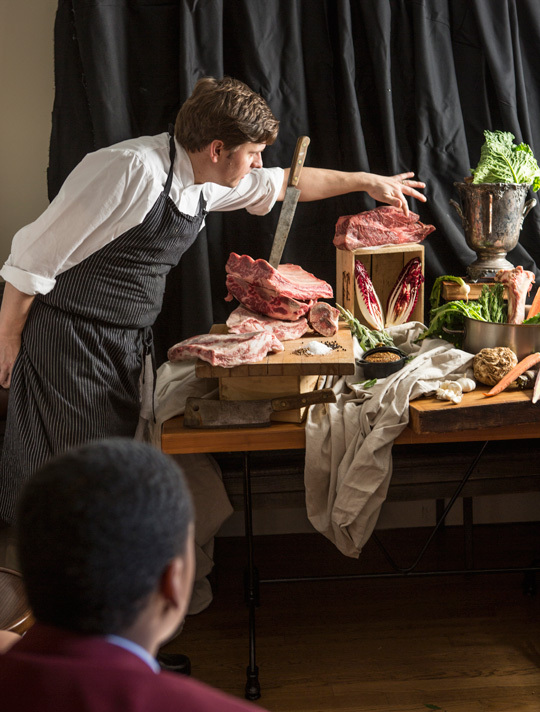 Chef Eli Collins of Pub & Kitchen describes the ingredients in his still life and how they are used in his signature dish. Image by Mike Persico. As a new art teacher, it felt natural for Deva Watson, also a food runner at Zahav and a server at Pub & Kitchen, to bring the restaurant model of focus and discipline—what she calls a “quiet intensity”—to her classroom at the Southwest Leadership Academy Charter School. Watson’s connection with the tight-knit community of Philadelphia’s food industry is also part of what has made her crusade to expand the cultural, educational and culinary horizons of her students so successful. Watson was finding a disconnect between the study of many traditional art subjects and what her students could relate to, which was only compounded by the lack of funding for resources and materials. And so, drawing again on her own experiences outside of the classroom, she introduced them to food-inspired still life masterpieces. Art teacher Deva Watson poses next to still life ingredients. Image by Neal Santos.A friend encouraged Watson to reach out to Barbara Chandler Allen, who had founded the nonprofit Fresh Artists in 2008 with her son in response to the failing state of art in Philadelphia’s schools. Through the program, selected art created by children is licensed to Fresh Artists, then scanned, digitized and returned to the young artist. When corporations make donations to Fresh Artists to deliver art supplies and programs to under-funded schools, they are invited to choose large-format digital reproductions from the collection as thank-you gifts. Fresh Palates to Palettes has the students study food-themed still life masterpieces, and even imagery in cookbooks. The class then visits Philadelphia restaurants where they meet with each chef, are served the chef’s signature dish for lunch and then sketch their own still life of a table set with the dishes—some so intricate they are prepared with tweezers. This year, the class visited Bistrot La Minette, Vernick Food & Drink, Pub & Kitchen and Lacroix. The final phase has the students working for 12 weeks in Watson’s classroom to create art based on what they saw at the restaurant. Chef Greg Vernick, of Vernick Food & Drink, talks to the students about their dish. Image by Neal Santos.Watson’s students can donate their artwork to Fresh Artists, but the nonprofit, along with the chefs, select what work ends up in the Fresh Artists collection. Kearse’s enthusiasm is echoed by Watson. “If there’s anybody who’s my people, and would help in anyway possible, it’s Ed Hackett [GM and overseer of Pub & Kitchen, The Diving Horse and Fitler Dining Room], Jonathan Adams [of Rival Bros Coffee] and Eli Collins [Pub & Kitchen’s new head chef] [who] have been incredibly supportive,” Watson says, referring to some of the program’s participants. Southwest Leadership Academy student Tyrese sketches at Vernick. Image by Neal Santos.For Watson’s students, Fresh Palates to Palettes teaches them that even seemingly simple food can be more than just food. If studied, if looked at from the right angle, if tasted with an open mind, the tiniest pea can become an entry into a world that never before existed. To be selected as the year’s participants (an increasingly coveted role), the sixth- and seventh-graders know that their behavior, work ethic and skill or improvement levels in the classroom matter.